Opis: These brightly reflecting fields of snow or frost are on the slopes of a crater rim in the northern hemisphere of Mars. They are 500 meters or so long and have lasted through about eight months of the Red Planet's spring and summer weather. 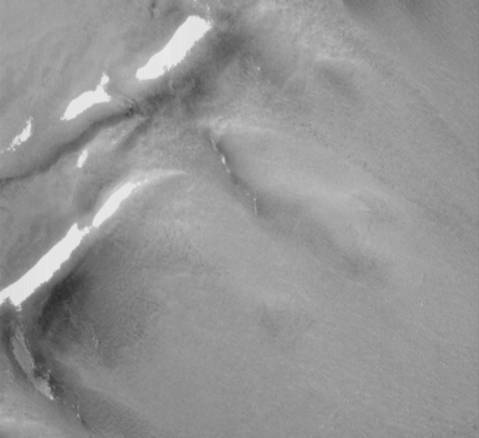 Recently imaged by the Mars Global Surveyor spacecraft, they also seem to be relatively uncrowded ... suggesting to some on April 1st, that lift tickets on Mars are extremely expensive. Of course, a vacation on the Red Planet could still offer some advantages to skiing and snowboarding enthusiasts. For example, Mars' low gravity - only about 3/8ths Earth's gravity - would definitely tend to reduce sore muscles and fall-related injuries. Happy April Fools day from APOD.